Verizon Digital Media Services has unveiled research finding that 59% of millennials' video viewing is now done on-demand, with 41% on live TV. Online accounts for 34% of millennials' viewing, with DVR following at 15% and on-demand at 10%. 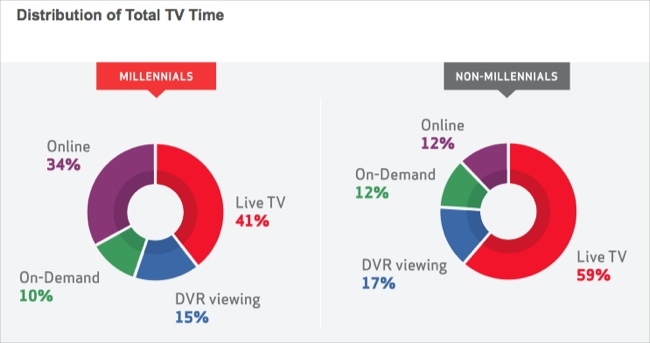 Non-millennials have the opposite viewing pattern, with 59% of their viewing still live TV, next is DVR with 17% with online and on-demand following at 12% each. Verizon found that 64% of millennials said they subscribe to an OTT video source, compared with 33% of non-millennials. Somewhat surprisingly in this age of device proliferation, millennials cited laptops as the top way to watch (68%), followed by desktops (44%), tablets (29%), smartphones (20%) and connected TVs (20%). Non-millennials cited desktops (52%), laptops (47%) and tablets (25%) with all others below 20%. In terms of features, millennials were most interested in access to live TV, then ultra-HDTV and device shifting. Awareness and engagement with binge-viewing is also much higher for millennials, with 63% having heard about all episodes of a show being released at once (vs. 48% for non-millennials) and 39% of millennials saying they frequently binge-view vs. 16% for non-millennials. 37% of millennials also reported having a second device on at least half the time they're watching TV (vs. 28% for non-millennials) though the majority of them said the activity isn't related to the program they're watching. In a bit of good news for pay-TV operators, fully 87% of millennials reported subscribing to some sort of pay-TV service, just less than the 91% of non-millennials who reported doing so. When asked what they would miss, 32% cited pay-TV, behind only desktop/laptop computers at 47%. The quantitative part of the survey was done in November, 2013, of 800 people age 16-34, defined as millennials and 200 people age 35-64, defined as non-millennials. The full report is available for complimentary download.